In the United Kingdom, for every young woman in the age range of 16 -24 who commits suicide, four young men do so. 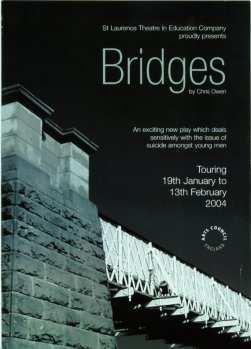 Bridges was written with the express purpose of dealing with this difficult subject matter and encouraging openness and discussion of the subject by the audience. It was commissioned by the director, John O'Brien of the St Laurence Theatre in Education Company - a professional Theatre in Education Company that was specifically formed for this particular project. To accompany the performances of Bridges, I also produced a 60+ page resource pack. This pack provides teachers and youth workers with additional background information about young male suicide and gives clear advice on how to approach the matter with students. A number of workshop activities were also included to extend the involvement and understanding of the audience. In addition we included a workpack provided by the Samaritans which looks at a wide range of issues that effect both young men and women. Members of the audience were given "credit cards" at the end of each performance with helpline telephone numbers for organisations that help young people in distress. Although the play is focussed on young men, it also had a strong impact on young women in the audience and the supporting activities provide opportunities for both sexes.